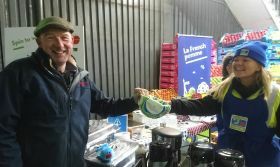 French apple exporter Blue Whale has embarked on a roadshow of UK and Irish wholesale markets, taking in markets in Newcastle, Bradford, Birmingham, London, Liverpool, Nottingham, Glasgow, Cardiff and Belfast between 18 January and 28 February. Events are set to be held in each city, with catering professionals and retailers invited to taste Blue Whale’s full range of apples, in particular Novablue, Tentation, Ariane and Joya. Blue Whale’s mascot will be present to attract visitors to play the company’s spin and win game for a chance to pick up Blue Whale goodies.